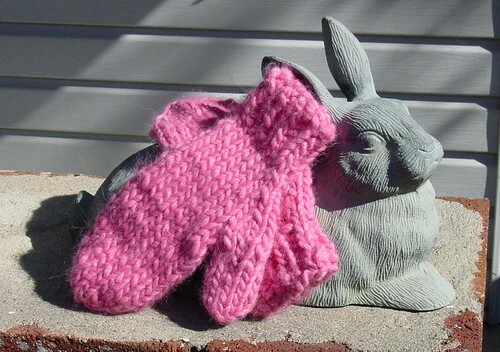 Here I present my set of pink mittens for Sandy’s “Warming Hands KAL” and for Eve’s Pretty in Pink contest. Now that I have knitted up a couple of pairs of mittens, I think I need to work on something else for a bit to destash my ton (would not be surprised if it really weighed that much) of yarn. I have been so wrapped up in many recent events. So much so that I forgot about a charity knit that I had signed up for earlier this summer! Immediately seeing my error, I have added the large button to my sidebar, and I hope those reading can help out. “Warm up the Dutchicans” began to help out fellow knitter Kristi of “Red Dog Knits” who is expecting triplet boys in January. I know how overwhelming it is with a newborn, but imagining it threefold? The stress from that image made me ponder what to make. Socks, hats, and blankets immediately came to mind. What I may do instead is pull out a Creative Knitting magazine and use one of the only patterns that I like from them: baby bath ponchos. I plan to use Lily’s Sugar ‘n’ Cream for the yarn, and hope the different colors will help distinguish one son from the other during bathtime. To make the bath set more challenging to make, I am going to add a matching washcloth. If I have enough time, a pair of booties to go with each set. Wish me luck!! Oh, I love these pink mittens, they look so warm and cozy, and yet so happy and cheerful in this great color! Cute rabbit too! 😉 Thanks for mentioning these two URLs, I’ll head right onto there to see how I can help. Thank you! This has been a humbling experience! Those are some great charity knit links–thanks. I’ll have to ponder if I would be able to spin up some black yarn. I am kind of new at it. btw, have you had time to look at the model your socks contestants? i think i recall you saying you wouldn’t mind judging. so if you can, soon, can you please email me your preferences for each category? thank you! oh, and what yarn did you use for the mittens? that is a pretty pink color! Great mitts! I’ve already signed up as a spinner, and thanks for getting the word out. Thank you so much for my wonderful KTS2 package! You really spoiled me! I haven’t tried to knit socks yet but want to. I think it’s great what you all are planning for the Amish. I wish I could help, but I don’t know how to spin. I am hoping that perhaps something good will come of this tragedy and perhaps the Amish will see that the non-Amish are not all bad or to be distrusted and perhaps we can learn a thing or two from the Amish and how they handle adversity. Somehow I have felt all along that the Amish were somehow always better at dealing with adversity in general because of their self sufficiency and their faith. Anyhow, thanks again for my package. My cats thank you too! Don’t think Ive been by here before, Nibbles was a real beauty, so sad to read she is no longer with you on earth. Just gorgeous, Ive never seen a black bunny before actually. This tragedy was hard to fathom, how this peaceful community could be impacted in such a horrible senseless way. Good to hear that people are pitching and trying to help, in any way they can.